Since Stop & Shop workers walked off the job Thursday, there has been an outpouring of customer support as New England communities rally together with the goal of making Stop & Shop a better place to work and shop. 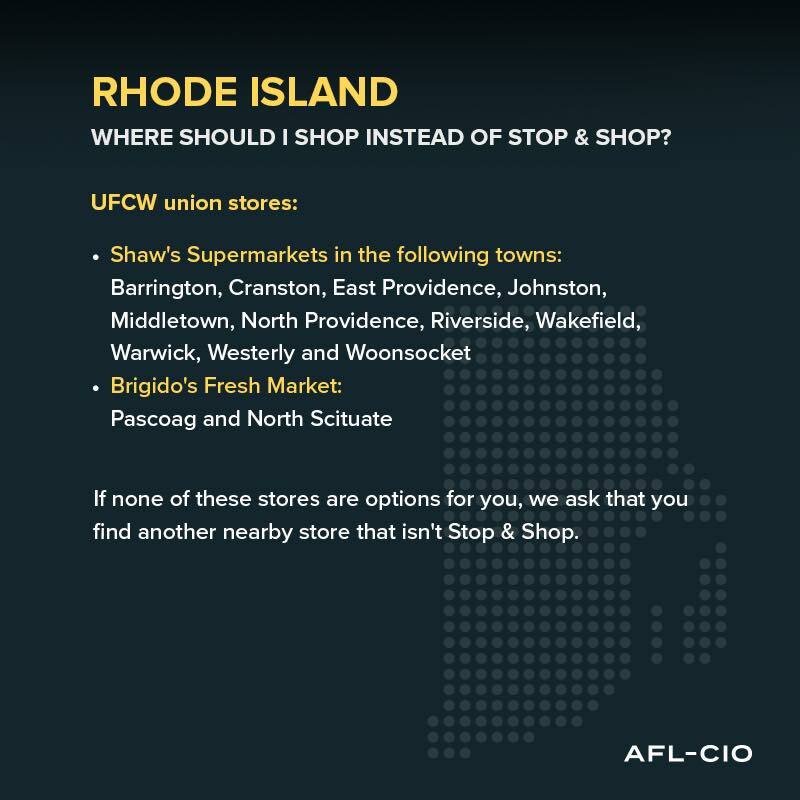 UFCW Locals 328, 919, 1459, 1445, and 371, representing all 31,000 Stop & Shop workers in New England, have been in negotiations with the company over a new contract for nearly three months since January 14th, with the current contract having expired on February 23rd. Despite Stop & Shop’s parent company, Ahold Delhaize, taking in more than $2 billion in 2018 and authorizing over $4 billion in stock buybacks from 2017 to 2019, the company is proposing unreasonable cuts to workers’ take-home pay, health care, and retirement benefits. In addition, the company unlawfully refuses to provide financial information to verify its claim that their proposed cuts are necessary. 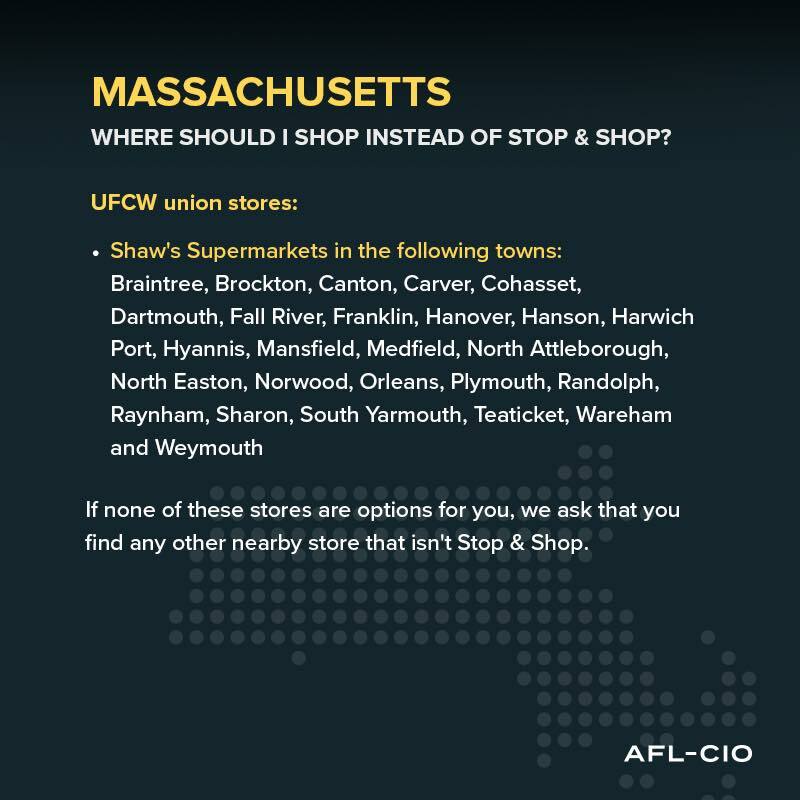 UFCW’s five New England locals are unified at the negotiation table and are asking for Stop & Shop to properly value the employees whose hard work and dedication have made their company so successful. Thank you to everyone who has shown their support so far. It means a great deal that in these divisive times, we can still come together as a community and have one another’s backs when it matters. The hardworking men and women of Stop & Shop pride themselves on their service to the community, and are humbled by the outpouring of support and encouragement received so far. If you would like to voice your support for Stop & Shop workers, sign the petition. 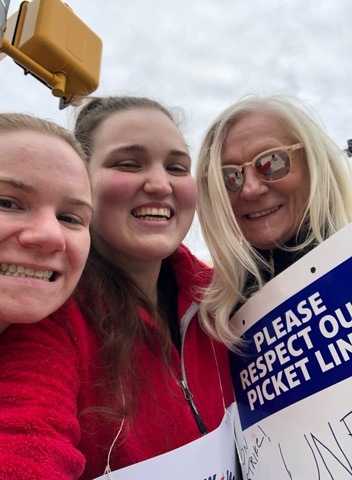 31,000 Stop & Shop workers from over 240 stores in Massachusetts, Connecticut, and Rhode Island walked off the job Thursday April 11. This massive worker protest comes in response to months of negotiations with Stop & Shop in which the company has refused to back down from proposals attempting to cut workers’ health care, take home pay, and retirement benefits. Stop & Shop is the number one grocery chain in New England. It is a subsidiary of multinational company Ahold-Delhaize, which reported more than $2 billion in profit last year. This is not a company in financial trouble. At the same time the company was demanding workers’ pay more for health care and lose Sunday and holiday pay, Ahold authorized $880 million in dividend payments to shareholders from 2017 to 2019. Ahold also recently received $217 million in corporate tax cuts. Amongst other actions, the company unlawfully refuses to provide financial information to verify its claim that their proposed cuts are necessary. Instead of investing in the workers who made the company successful and who take care of their customers, Stop & Shop is trying to stiff them. The decision to walk off the job is a tough one. If one person were to try to fight back on cuts like these by themselves, they wouldn’t stand a chance. But the 31,000 workers who made this choice are doing it together as one union family. None of them have to fight for their health care and benefits alone. 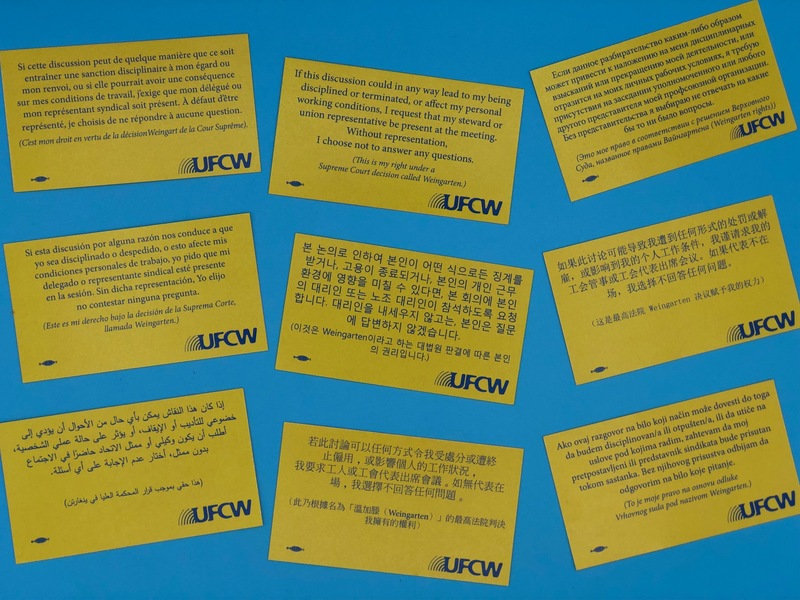 Together they can fight these cuts and protest the company’s unlawful actions in connection with negotiations—and win. .
UFCW members who work at Stop & Shop could use your support. If you live in New England, please don’t cross the line. Please stop at other union stores. 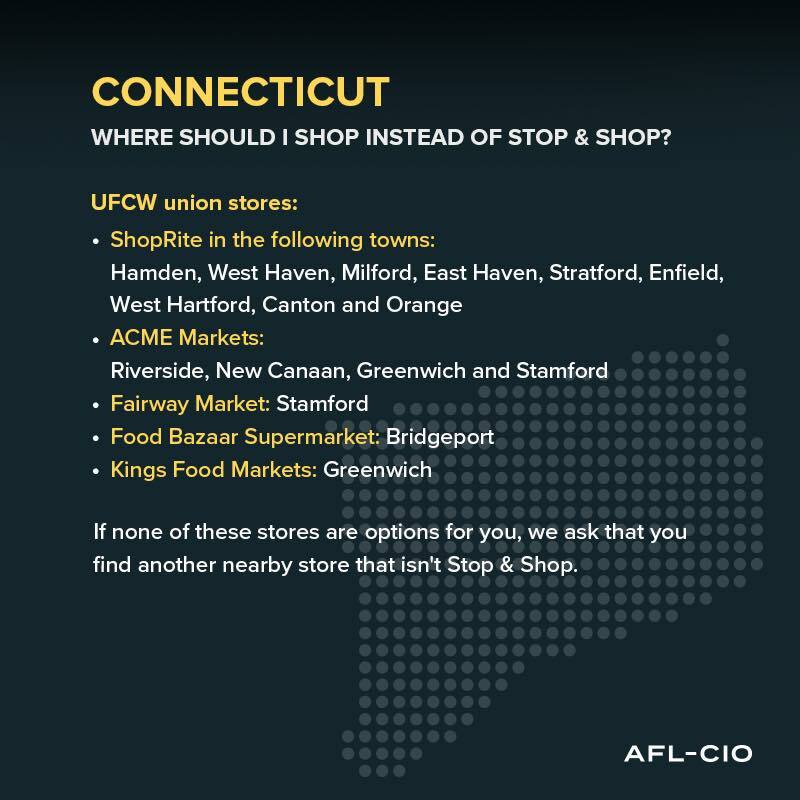 Please sign our petition and stand with UFCW Stop & Shop workers for a contract that allows them to deliver excellent customer service while still being able to provide for their families. It’s time for Stop & Shop to reach a fair contract agreement that reflects the true value of its workers. Or Text “support” to 698329 to sign the petition by mobile. Whether you are a roller coaster enthusiast or just like an excuse to eat funnel cake, your UFCW membership gives you discounts on some of the most popular parks in the country. Accessing your discounts does require setting up an account on the UFCW Lifemart Discounts website, which is free for UFCW members. From there, you’ll not only get access to discounts on theme parks, but discounts on movie tickets, hotels, car rental, and more that can help you squeeze a little more fun out of your wallet. Why Is There An Equal Pay Day? Each year, Equal Pay Day is recognized on different days depending on the year and the country because it symbolizes how far into the year women must work to earn what men earned in the previous year. Another way of looking at it is that if men and women both started working January 1, 2018, then men got to stop working December 31 and the women have been working since then for free. That’s because women made 20% less on average in 2018 than men. The gap only gets wider when you also take race and ethnicity into consideration. Asian-American Women’s Equal Pay Day was also recognized this year on March 5th, and Mom’s Equal Pay Day, which compares the pay of all working moms to that of working dads, will be on June 10th. The good news is that even though all the factors that contribute to women earning less than men are complicated, simply belonging to union and having the support that comes from being part of a union family goes a long way in evening out the wage gap. Unions raise wages in women-dominated service occupations (which include food service and janitorial services). Union women working in those industries make 87% more in total compensation and 56% more in wages than their nonunion counterparts. And overall, hourly wages for union women are 9% higher on average than for nonunionized women. Crystal Quarles worked as a teacher for nearly 15 years and made $8/ an hour with no health insurance. When she started at Kroger in 2014, she joined the UFCW Local 700 without hesitation. Because of her 6-month wage increases she is now at her top rate of pay. As a single mom, she is very glad to have a contract where women are paid the same amount as men for the same work. Being paid different amounts for the same level of work isn’t the only thing that keeps women stuck earning less. Sometimes, it’s lack of access to higher paid positions. There again unions help ensure equal access to opportunities for advancement for all workers. In March of 2014 Marlenny Solaris, a UFCW Local 342 member, heard there may be a job opening she could bid on at the nursing home where she worked. This Porter job was typically performed by men in the Porter classification, and she was told by the Supervisor that it was not a woman’s job. When the Home did not put the posting up, Solaris bid on another job and got it. Only after she received her new position did her supervisor post the full-time Porter classification job Solaris had originally expressed interest in. Local 342 Representatives backed Solaris when she again applied for the now posted Porter position and then she got it. This paved the way for more women who have since taken jobs at the nursing home as Porters. 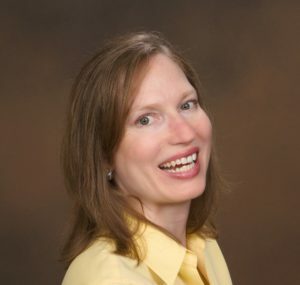 Her situation also shows how the ways in which women can be prevented from having access to higher-paid positions can be complicated, because without a union there to represent her, there’s little chance Solaris would have been able to even apply for the position she was qualified for and had expressed an interest in. Union membership also helps provide training to help level the playing field for hardworking men and women, regardless of gender. For UFCW Local 1776KS member Carla Dorsey, Women’s History Month is a time to help her union sisters and all workers build a better life. 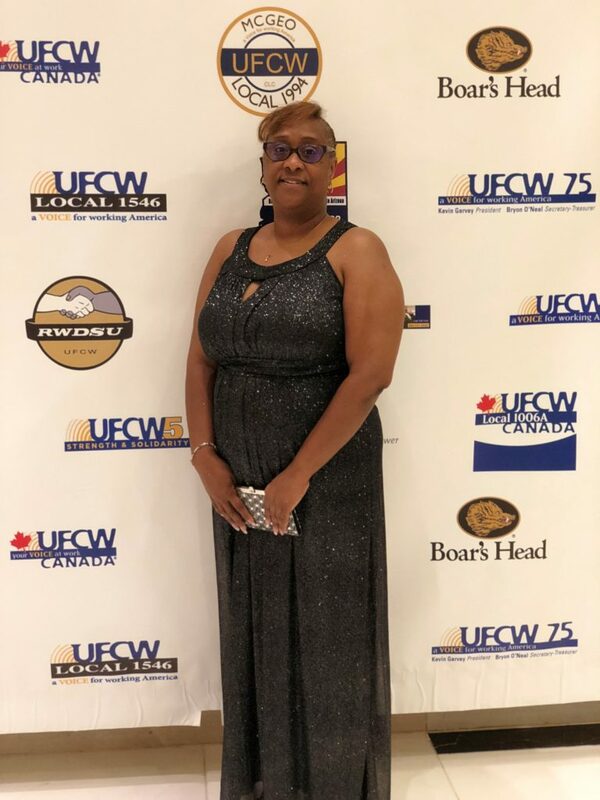 Dorsey, who is a pharmacy tech at Rite Aid in Philadelphia, has been a member of UFCW Local 1776KS for almost 27 years and has served as a steward for 20 years. She was mentored by her own shop steward years ago, who took the time to show Dorsey the important role stewards play in our union. When her steward eventually left, Dorsey felt it was a role she could fill. As a steward, Dorsey has played an important role in helping colleagues in need. In one instance, she made sure that one of her union sisters could take time off from work so that she could recover from an assault. She also made sure that her colleague had access to the employee assistance program and helped to raise funds while her colleague was out of work. In another instance, she helped another colleague arrange for counseling for depression. Dorsey also enjoys helping people outside of work. Before the holidays, she and fellow UFCW Local 1776KS member and steward Sylvia Hovington donated 40 bags of toiletries, socks and other items to a homeless shelter for LGBTQ teens. They also hosted a similar back to school night drive for children who participate in a skating program Dorsey runs, and gave out 150 bags with school supplies with the help of a donation from UFCW Local 1776KS. 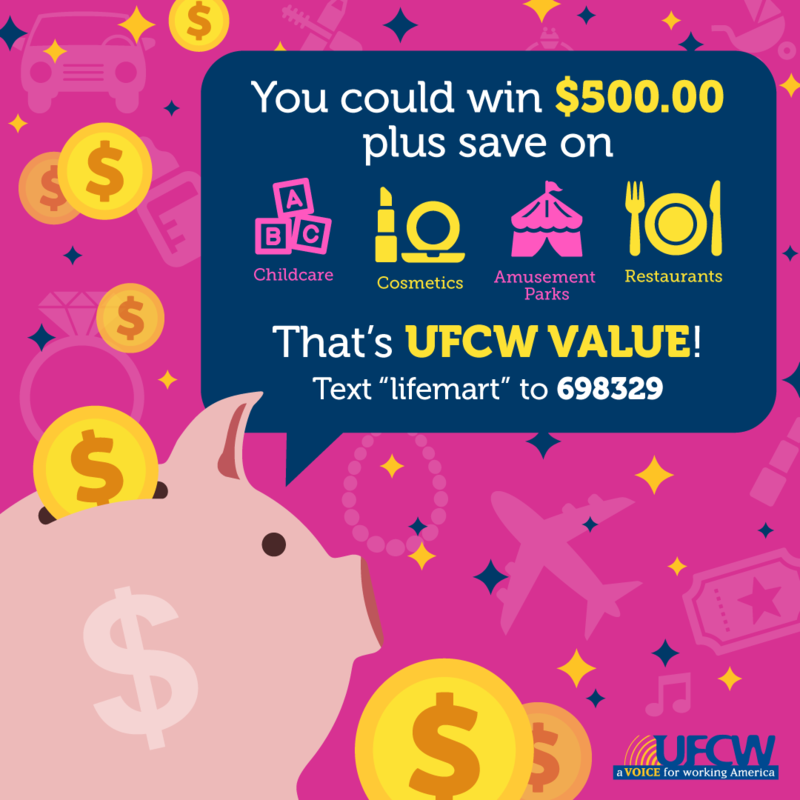 LifeMart, one of the UFCW’s discount programs, is holding a sweepstakes exclusively for UFCW members this month. Members can win a $500 gift card just for registering for UFCW LifeMart discounts or by signing into an existing account. Should we be worried about dynamic pricing in retail? Ever go to tell a family member or a friend about a great deal you found online, but when they go to buy it too, it’s no longer there? Or maybe it costs way more than you paid for the same thing? While you got a great deal, what you’re experiencing is the phenomenon known as “dynamic pricing” or raising and lowering prices many times a day, a week or a month to drive sales but still ensure a consistent profit. This is often paired with what is called “personalized pricing” or “cohort pricing” where each shopper gets their own price for a product – what’s my price isn’t yours and vice versa. These are marketed to consumers as a benefit – deeper discounts just for you — but in the end, may actually end up benefiting the retailer at your expense. So if everyone is saving, how are retailers making money? In the case of things like groceries, people tend to buy the same items over and over again. Since you’re not the only shopper, companies like Amazon sometimes charge one shopper triple what another one pays for the same item. Companies are able to get away with doing this because as customers, we don’t actually have a single price we’re willing to pay, we have what’s called a “latitude of price acceptance.” That’s a band of prices—from a steal to a little pricey—that we’re willing pay for an item. According to McKinsey & Co., that price variance can be as much as 17% , which is a lot of extra money to be made if you move to the top of the band. While price fluctuations aren’t new and dynamic pricing has been around since the 1980s, having those changes determined by Artificial Intelligence, or AI, is uncharted territory. As retailers battle it out to find that exact pricing sweet spot that maximizes both sales and profits, evolving technology raises concerns about what the effects are on both consumers and smaller businesses when large companies like Amazon use AI and algorithms to enhance profitability with little oversight. AI-driven personalized pricing relies on tracking and retaining information on customer behavior. That means whoever has the most information on you has a competitive advantage over their rivals. Beyond the security and privacy concerns of big data, this also means that the playing field is tipped even further in the favor of large companies like Amazon, who reached over 100 million Prime members in the US in January. According to Amazon’s Privacy Notice page, the retail giant collects and analyzes everything from purchase histories and products viewed or searched for to reviews, wish lists and length of visits to certain pages. This huge pool of data on its customers’ shopping habits can help Amazon better understand what shoppers are looking for, what they buy and what prices they are willing to pay. Increasingly, company leaders are recognizing that a dynamic pricing strategy supported by big data and artificial intelligence (AI) can help them gain a competitive pricing advantage over rivals. With deep insights into the personal preferences and online behavior of about a third of the US population, not even including the shoppers who are not Prime members, Amazon isn’t just a retailer, but a data company. While the law prohibits assigning prices based on protected characteristics—like race or gender—personalized pricing is by its nature nontransparent, meaning you can’t see everyone’s prices. That means you may not know that women, for example, are charged more for the same item, because the only price you see is the artificially high one. If we know companies have information on your race or gender, and we also know the AI-driven dynamic pricing responds to your unique set of data and characteristics, how would anyone know if the law was being violated? We don’t know—and we’re not sure anyone else does either. But we also believe that honesty and transparency are essential. Lawmakers should be wary of technology evolving faster than our laws, or the ability to enforce them, can keep up with, especially if that technology is skewed to benefit powerful retail industry players like Amazon.